Ire and fury are expected to rain down on several properties owned by President Donald Trump that lie in the projected path of Hurricane Irma. 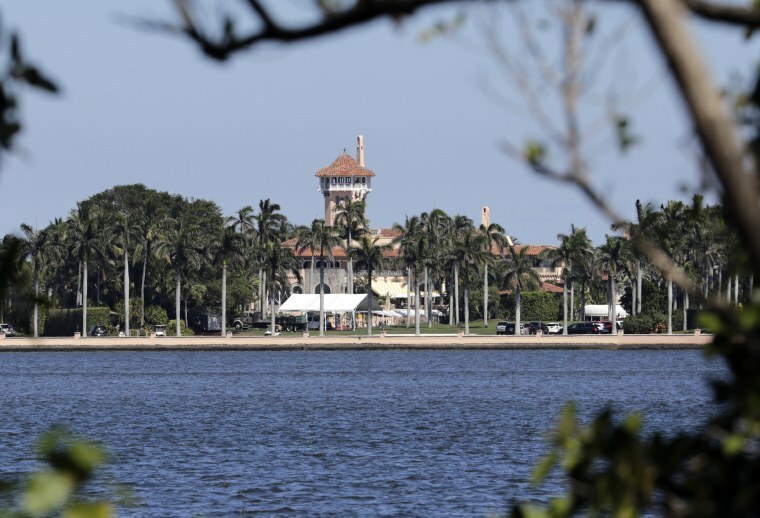 Three of the 12 Trump-named U.S. golf courses are in south Florida and due for impact, as well as Trump's Mar-a-Lago estate, dubbed his "Winter White House." The private club and resort with an estimated value of $175 million lies in the mandatory evacuation zone announced for Palm Beach County last night. “Our teams at our four properties in Florida are taking all of the proper precautions and are following local and Florida State Advisories very closely to help ensure that everyone is kept safe and secure," a Trump Organization spokesperson said in an emailed statement to NBC News. The three privately owned properties in Florida have been closed. Guests at Trump's National Doral Hotel have been encouraged to find somewhere else to stay, the spokesperson said, and no new reservations are being accepted. The hotel is not currently in a mandatory evacuation zone and all cancellation penalties and change fees have been waived. "We continue to send our thoughts and prayers to victims of Hurricane Harvey and are praying for those that are in the path of Hurricane Irma,” the Trump Organization spokesperson said. On Wednesday morning Hurricane Irma slammed through the Caribbean island of St. Martin, where Trump owns a waterfront estate. The damage to the property that was on the market at a reduced rate of $16.9 million is unknown, but initial reports indicate the tropical playground for the globally rich and famous suffered widespread devastation. "It’s an enormous catastrophe. Ninety-five percent of the island is destroyed," Daniel Gibbs, president of St. Martin, said in a radio interview. Several other Trump Organization properties could also be tested by a diminished Irma if it turns north once it reaches Florida, as several computer models predict. Then it might lash the Trump National Golf Club in Charlotte, North Carolina; and the 1,300 acre Trump Winery in the foothills of the Blue Ridge Mountains in Charlottesville, Virginia.